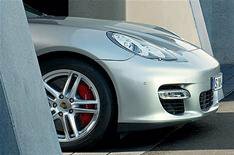 First picture: Porsche Panamera | What Car? This is the first official picture of the Porsche Panamera, which will go on sale next year. It will be Porsche's first-ever production four-door coupe and will provide the platform for the next-generation Cayenne, too. The photo shows only the Panamera's front end, which is heavily based on the established look of the 911, Boxster and Cayman. Engines are expected to include an all-new Volkswagen 3.5-litre V6 with around 300bhp, a non-turbo version of Porsches 4.5-litre V8 with 350bhp and a turbo version with around 560bhp enough to give 0-62mph in under 5.0sec. A reworked version of the Carrera GTs 612bhp 5.7-litre V10 unit may also be in the pipeline, as is a hybrid that combines petrol power with an electric, battery-powered motor. Further details are expected to be released in late October.